Uncle Bill's Pet Centers. 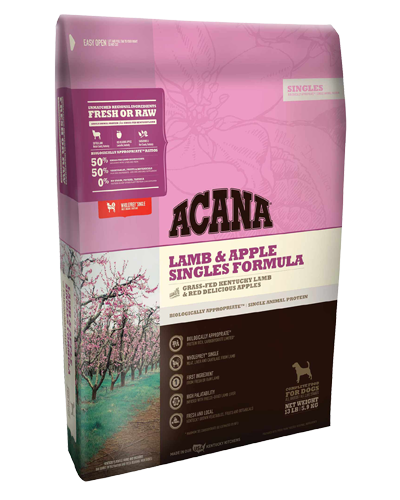 Acana Singles Limited Ingredient Lamb and Apple - 4.5 lb. Acana Singles Limited Ingredient Lamb and Apple - 4.5 lb. At Uncle Bill’s Pet Center, we not only offer Acana dog food for sale, we also employ a highly trained staff that can assist you in finding an appropriate formula. Loaded with 50% grass-fed Lamb to nourish your dog according to his evolutionary needs, ACANA Lamb & Apple contains one single, easily digestible animal protein. Grass-fed on local Kentucky farms, our lamb arrives FRESH or RAW, in WholePrey™ form — a richly nourishing ratio of meat, tripe, liver, kidney and cartilage to nourish your dog naturally. Generous infusions of freeze-dried lamb liver make ACANA the perfect choice for fussy dogs. We will be glad to work with you to ensure that you feed your dog quality food for optimal health and happiness by providing the best selection and value on premium dog food for sale in Indiana. 4.50 lbs. 13.20 lbs. 25.00 lbs.